A wonderful story with a satisfying ending! 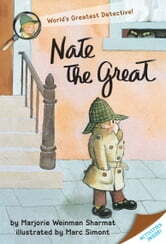 Nate solves a real mystery but - unlike, say, Scooby Doo - without any spookiness or tension. The easy and funny text is perfect for new readers. We loved the whole cast and have followed on to the other books in the series. A kid's picture book about a neighborhood sleuth. Here, he searches for Annie's missing painting of her dog. Humor for adults and a mystery that kids can solve make this a winner.